Familiarity and surprise are the apples and oranges of the television industry. Sometimes audiences crave one, and sometimes they hunger for the other. It’s an important distinction to consider when tuning in and, especially, when reviewing a new series. Not many shows break ground; fewer still manage to soar above it. It’s worth remembering that even in this glorious era of flying dragons and true detectives, the majority of TV shows aren’t looking to reinvent the wheel. What they want is to roll for as long as possible. Oh, look. You get it. But don’t give up just yet. Peek past the musty bones borrowed from a decade of network procedurals — not to mention the influence of Bones, creator Hart Hanson’s previous success story — and there’s plenty to like about Backstrom. Let’s start with the most familiar piece of all, star Rainn Wilson. Just a couple of years removed from a nine-season run humanizing another asocial creep on The Office, Wilson still snarls with the same sour brio. (To hear Wilson explain his decision to dive straight back into another series, check out my podcast with him here.) His Everett is as gloomy and soggy as the show’s Portland surroundings; he’s a rain cloud with a badge. And while the rest of his Scooby gang is — just like the show’s Portland surroundings! — almost preposterously quirky, they serve as a welcome counterbalance to Wilson’s waterlogged weight. Dennis Haysbert, solid as a Douglas fir, is typically excellent as Detective John Almond, a cop who moonlights as a preacher. Kristoffer Polaha has fun as Sergeant Niedermayer (no relation, I’m sure), a forensics expert with a tendency to quote philosophy. And I quite liked Page Kennedy (Blue Mountain State) as Moto, a uniformed cop with a past in MMA, and Beatrice Rosen as Nadia, a French civilian who hangs out in Portland PD HQ because, I don’t know, I guess it beats opening a food cart. What matters in Backstrom isn’t the crimes — though, to be honest, I expected them to be a little jazzier, considering the show is based on a well-regarded series of Swedish detective novels — it’s those working together to solve them. This seems like a minor distinction, but it actually matters quite a bit. Backstrom was originally developed for CBS, where it would have fit in about as well as a Walmart on Alberta Street. Though widely credited for being family-friendly with its old-school programming choices, CBS’s blockbuster lineup of procedurals is actually a smoothly running death machine. Week after week, across various CSIs and NCISes, a steady diet of corpses is chummed up into ratings. The presence of LL Cool J and Scott Bakula is nice but ultimately inessential. CBS isn’t selling stars. It’s selling the gruesomeness of crime and the subsequent, reassuring tidiness of its implausibly quick resolution. Backstrom is certainly familiar with this assembly line: Everett clears more dramatic cases in the first four episodes than the entire state of Oregon is likely to see in a year. But the spanner in its works is a stubbornly beating heart. All the darkness massing in Everett’s mind and midsection can’t obscure the fact that Backstrom is basically a show about life. Hanson just can’t help himself. 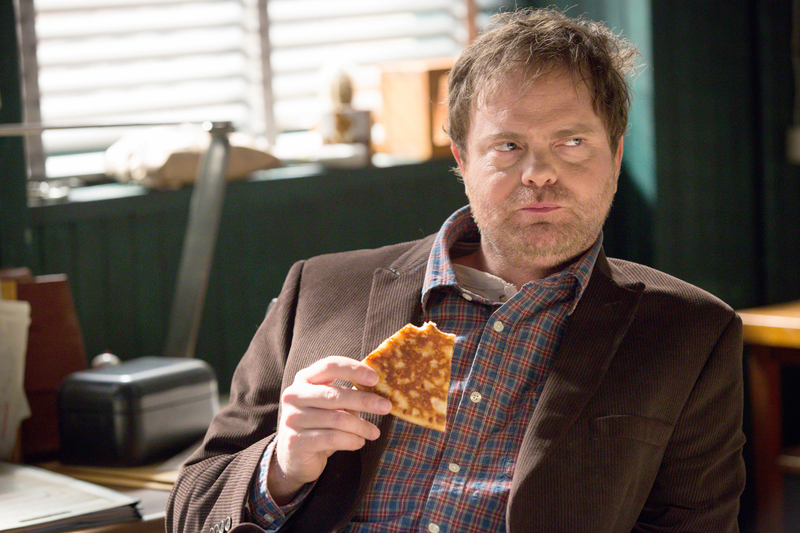 His scripts are long arcs that bend toward banter, and Backstrom protects its kookiness far more meticulously than its crime scenes. Audiences have a right to remain delighted. So sue me — or, in true Everett style, arrest me — for no reason other than pique: I prefer this to the alternative. When we spoke, Wilson said there was absolutely a “cable version” of Backstrom, in which cases bleed out over multiple seasons and Everett’s misanthropy is more of a threat than a diversion. But the reality is, that version would be far, far worse! Yes, it’s important to take TV seriously, but grim seriousness isn’t always the answer. Backstrom isn’t a great drama, but I suspect it has no intention to be. “I don’t see the worst in everyone,” Everett growls in next week’s episode. “I see the everyone in everyone.” Fair enough. I see the traces of every show in this one, and I don’t mind it one bit.